Home > Strategy > Carrier warehousing, anyone? Averitt Express carves out a niche staging e-commerce stuff in its truck terminals. Fishers Finery doesn't happen to be one of those shippers. In fact, the New London, Conn.-based manufacturer and online retailer of ecologically friendly clothing, jewelry, bedding, and lifestyle items doesn't use Averitt's trucks for its customer deliveries. Yet for the rest of its products' journey from eight overseas factories—seven in China and one in Italy—to customers across the U.S., Averitt has become indispensable. At the heart of Averitt's value proposition is a service that few truckers offer: warehouse space embedded in its terminals. Though carriers sometimes provide warehousing and DC capacity at locations apart from their terminals, it is unusual to carve out warehouse space within them. At Averitt, this means using all available space—which will include its trailers—should capacity inside its 85 terminals get tight, according to Phil Pierce, executive vice president, sales and marketing for the privately held Cookeville, Tenn.-based company. Capacity in each terminal will vary, Pierce said. Shippers are not required to sign a contract to use the common warehouse space. However, Averitt requires a legal time commitment to utilize its seven contract warehouses, which are separate from the in-terminal locations, Pierce said. 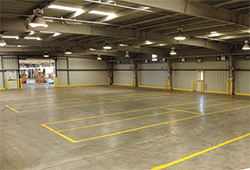 Fishers uses Averitt's common warehouse space. Carrier warehouses like this Averitt facility can be a way for smaller importers to level the playing field. For Fishers, a four-year-old company growing at a 100-percent annualized rate but still watching every dollar that goes out the door, the Averitt service has been a solid fit, according to Craig Barnell, Fishers' co-founder. E-tailer Amazon.com Inc.'s "Fulfillment by Amazon" (FBA) service, which Fishers uses exclusively for its direct-to-customer fulfillment, has warehousing capabilities. However, the warehouse fees are generally uncompetitive, mostly because Amazon's process isn't structured to store goods by case-packs, which is how Fishers wants to receive them for fulfillment. Storing by the case-pack requires a different racking system and operational footprint, and it doesn't mix well with Seattle-based Amazon's standard retail fulfillment process, according to Barnell. Amazon "doesn't want to be a Fishers Finery warehouse," he said. Furthermore, because Fishers' inventory turns four times a year, the merchandise would need to be warehoused at Amazon's centers for months at a time. Barnell couldn't justify the ongoing cost. "It's a fortune," he said. Using the Averitt service lets the retailer avoid that expense. Barnell estimates that warehousing Fishers' inventory with Averitt costs about one-sixth what it would with Amazon. To understand Averitt's role in Fishers' supply chain, it helps to know something about the retailer's distribution operation, which supports about 2,000 stock-keeping units (SKUs). About 80 percent of Fishers' U.S. imports enter in less-than-containerload (LCL) service through the Port of Long Beach. The remaining 20 percent is flown to DHL Express's U.S. air hub outside of Cincinnati. Averitt is Fishers' exclusive freight forwarder and customs broker for all shipments, managing the process from the purchase order to delivery to the carrier's warehouses. Once the goods enter the U.S., they are either drayed by a third-party trucker to an Averitt terminal in Hawthorne, Calif., about 15 miles south of Los Angeles, or move via intermodal service to Averitt's main customs clearance facility in Memphis, Tenn., where, once processed, they are trucked by Averitt to its terminal in Erlanger, Ky., just outside Cincinnati. At the Hawthorne and Erlanger facilities, both of which are located near Amazon fulfillment centers, Averitt holds Fishers' goods until a customer order is received. Working with Amazon's IT systems, Fishers chooses either an LTL carrier or UPS Inc.'s ground-delivery service to pick up at the Averitt warehouses and deliver to the Amazon facility. Fishers has access to ultra-low less-than-truckload (LTL) rates negotiated by Amazon through the e-tailer's "Seller Central" service. (Averitt, which is not a preferred Amazon carrier, does not participate.) Averitt then handles the picking, packaging, labeling, and reconciliation, and prepares the shipment for carrier pickup. Upon arriving at an Amazon facility, the goods are distributed through the FBA service. Fishers' products reside in Amazon's centers only as long as it takes to move them out the door, Barnell said. Averitt has already done the heavy lifting to ensure that the stays with Amazon are as brief as possible, he added. Averitt provides Fishers with one through bill of lading, one consolidated invoice, and one point of contact with a dedicated account manager, according to Barnell. What's more, Fishers doesn't need to hire an in-house logistics practitioner to manage the process, Barnell said. Barnell had his pick of hundreds of freight forwarders and customs brokers, as well as an abundance of customer fulfillment centers that perform pick and pack services. However, none of the centers wanted to manage fulfillment requests for Amazon by case-pack quantities. Once Barnell realized that Averitt could provide the inbound support and the warehouse capacity to handle goods the way he wanted, he thought, "Why couldn't they be the DC?" Fishers could have opted for a lower-cost inbound service provider than Averitt. However, Barnell was unwilling to roll the dice with a less-seasoned partner in the complex and demanding international logistics arena. Besides, the back-end savings on warehousing and LTL, as well as avoiding the payroll drag of hiring an employee to manage logistics, offset the higher front-end costs, he said. Averitt expanded into carrier warehousing about five years ago through a long-running delivery relationship with retailing behemoth Wal-Mart Stores Inc. Because Wal-Mart's vendors—who were Averitt's customers—already held their goods at Averitt's terminals, the carrier was able to quickly move them from the warehouse to the truck. This helped Averitt consistently hit Wal-Mart's four-day "must-arrive" requirements. The model took on more relevance after Bentonville, Ark.-based Wal-Mart compressed its delivery deadlines to one day for perishables and two days for dry goods to meet more demanding e-commerce delivery standards, according to Pierce, the Averitt executive. Through the warehousing model, Averitt successfully adjusted to the tighter windows, Pierce said. Much was riding on Averitt's performance: Failure to meet Wal-Mart's requirements can result in a chargeback to the shipper, a ding to the shipper's compliance score, or both. The success with Wal-Mart's vendors led Averitt to push out the solution to the broader retail market, especially with e-commerce shippers that supply to marketplaces like Amazon and independent merchants selling through their own websites, Pierce said. The Averitt executive said the service is not designed for businesses seeking traditional long-term storage capabilities. "We are not in the storage business," he said. "But if a company is looking to use our warehousing as a way to accelerate its forward supply chain, that's where we can help." According to Barnell, there are millions of e-merchants just like Fishers: smaller, fast-growing concerns looking to connect overseas producers with U.S. consumers, and trying to level the playing field through cost-effective services like carrier warehousing. For them, the Averitt model may be worth exploring, he said. "Averitt has been a godsend for us," he said. Feedback: What did you think of this article? We'd like to hear from you. DC VELOCITY is committed to accuracy and clarity in the delivery of important and useful logistics and supply chain news and information. If you find anything in DC VELOCITY you feel is inaccurate or warrants further explanation, please ?Subject=Feedback - : Carrier warehousing, anyone? ">contact Chief Editor David Maloney. All comments are eligible for publication in the letters section of DC VELOCITY magazine. Please include you name and the name of the company or organization your work for.